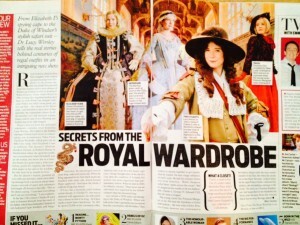 I’m happy to be able to direct you to a smorgasbord of information about our new documentary, ‘Tales from the Royal Wardrobe’, that’s going to be shown on Monday night at 9 on BBC Four. Here’s the story of how it all came about, from our curators’ blog White Gloves and Muddy Boots. 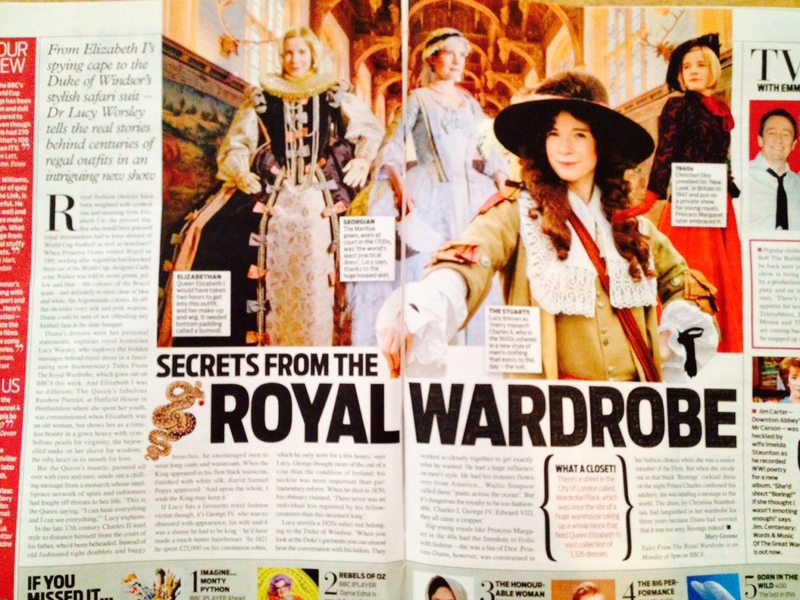 ‘From Elizabeth I’s spying cape to the Duke of Windsor’s stylish safari suit – Dr Lucy Worsley tells the real stories behind centuries of regal outfits in an intriguing new show. Royal fashion choices have always been weighed with symbolism and meaning from Elizabeth I to the present day. But who would have guessed royal dressmakers had to keep abreast of World Cup football as well as hemlines? When Princess Diana visited Brazil in 1991, not long after Argentina and knocked them out of the World Cup, designer Catherine Walker was told to avoid green, yellow and blue – the colours of the Brazilian team – and definitely to steer clear of blue and white, the Argentinian colours. In off-the-shoulder ivory silk and pink sequins, Diana could be sure of not offending any football fans at the state banquet. Diana’s dresses were her personal statements, explains royal historian Lucy Worsley, who explores the hidden messages behind royal dress in a fascinating new documentary Tales from the Royal Wardrobe which goes out on BBC Four this week. And Elizabeth I was not different. The Queen’s fabulous Rainbow Portrait, at Hatfield House in Hertforshire where she spent her youth, was commissioned when Elizabeth was an old woman, but shows her as a timeless beauty in a gown heavy with symbolism: pearls for virginity, the bejewelled snake on her sleeve for wisdom, the ruby heart in its mouth for love. But the Queen’s mantle, painted all over with eyes and ears, sends out a chilling message from a monarch whose intelligence network of spies and informers had fought off threats to her life. ‘This is the Queen saying: ‘I can hear everything and I can see everything’,’ Lucy explains. If Lucy has a favourite royal fashion victim though, it’s George IV, who was so obsessed with appearance, his wife said it was a shame he had to be king – he’d have made a much better hairdresser. ‘In 1821 he spent £25,000 on his coronation robes, which he only wore of a few hours’, says Lucy. George thought more of the cut of a coat than the condition of Ireland; his necktie was more important than parliamentary reform. When he died in 1830, his obituary claimed, ‘There never was an individual less regretted by his fellow creatures than this deceased king’. *this was actually a comment from my colleague Deirdre Murphy mistakenly attributed to me. Another fascinating documentary to watch this Monday! Wonderful! They cannot happen often enough for me, I have enjoyed them all very much. I have always been an enthusiast for all things “historical” but there are only a few people who are truly able to bring the subject to life in their documentaries and I can tell you, yours have always exceeded my expectations. Quite what your voice has to do with anything I’m not sure – (you requested comments from women to offset those criticisms received from men?) – please ignore any such irrelevant remarks and continue with your quest to bring us inspiring and enlightening programmes!